What job did Samuel have? 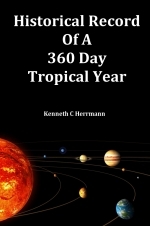 It has been seriously suggested by some Bible scholars that the earth had a shorter tropical year in the past; a year of exactly 360 days; and that the lunar month was an exact 30 days, rather than the present 29 1/2. This concept, normally familiar only to fundamentalists and Bible scholars, gained worldwide attention in the 1950s with the publication of Immanuel Velikovsky's Worlds in Collision, which convincingly presented evidence that planetary orbits as well had been altered in the historic past. The purpose of this paper is to determine the truth or error of this contention that our solar system was markedly different in the past with earth, moon and planets in different orbits, and with different periods than those we note today. In arriving at a conclusion we have retained the Biblical account and basic chronology upheld by Velikovsky and also the validity of the unusual astronomical observations he has supplied with so much labor. But his concept of differing orbits will be called into question and thoroughly disproven.